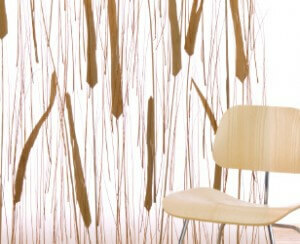 Walls are the most traditional form of office dividers. But they’re expensive and difficult to move without a full remodel. These days, businesses are looking for simpler, faster, and cheaper ways to create divisions between work areas. Here are a number of unusual ways they can do just that. 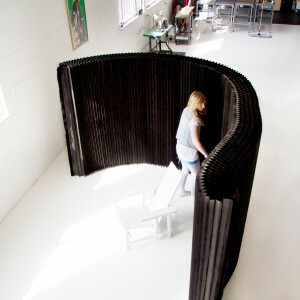 One of the most flexible and unique ways to divide space is with freestanding accordion partitions. Molo, a NeoCon 2014 Gold winner, is a well-known provider of this type of solution. Their Tyvek honeycomb architectural products are designed to dampen sound and visually separate space. Because this type of privacy screen can be easily reconfigured by one or two people, it’s an attractive option for employees who like to take control of their work environment. Sometimes, space separation is more about visual delineation than physical barriers. It’s possible to use color, texture, and light to divide one space from the next. For example, colored floor tiles laid down in geometric or curving patterns can carve pathways through the workspace and create diverse environments for each department or “zone”. Extravagant architectural lighting installations from companies like Seeyond can make walls or ceilings completely unique in each work area. Some of these solutions even create alcoves within the workspace by arcing in curving lines from floor to ceiling. These internally lit structures feature different levels of brightness or even different colors to impact mood. Installations from companies like 3Form and LOFTWalls take a semi-transparent and entirely artistic approach to office space division. These pieces of a glass or acrylic can be curved or flat, colored or clear, textured or smooth. Many designs contain inclusions of natural or manmade materials to add visual interest. They may be specified as free-standing panels, but many are used as inset decoration in other structural components. At the individual workstation level, cubicle walls have long been the standard for office dividers. However, the advent of the open office has created demand for a more customizable solution. 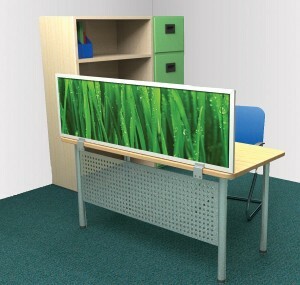 Our OBEX desktop mounted privacy panels achieve that objective. With a wide variety of textiles, polycarbonate tiles, and even custom-printed panels, these products are another example of how space division has gone beyond the boring, blank wall.